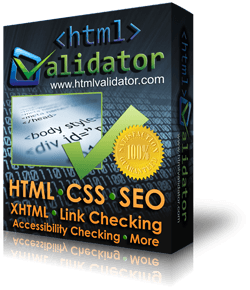 The CSS HTML Validator Batch Wizard lets you check entire websites for proper HTML & CSS syntax, spelling, SEO (search engine optimization), broken links, and more. 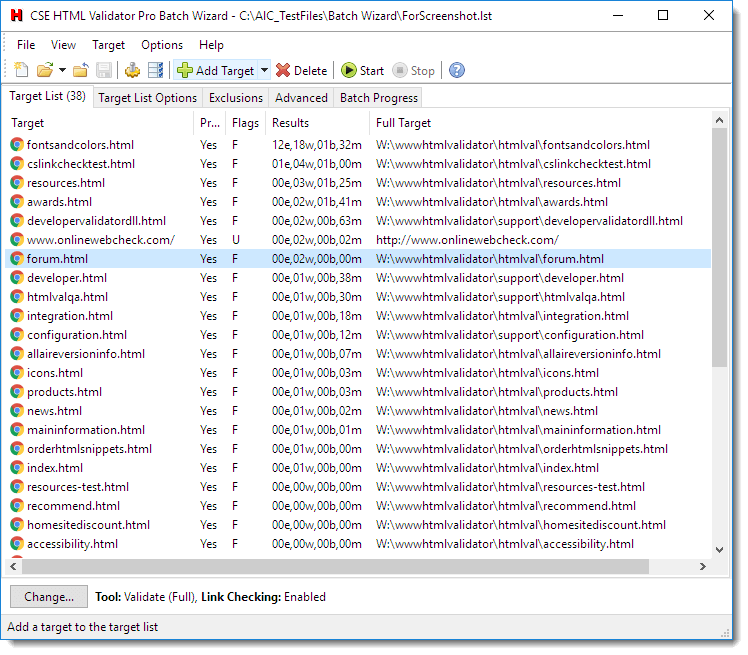 Simply launch the Batch Wizard from CSS HTML Validator by pressing F2 (or choosing Tools->Batch Wizard) and create a list of targets that you want to process (i.e. validate). Targets can be URLs, files, or folders. Set the Batch Wizard to do what you want to do (validate, spell check, link check, etc) and then run the job to process the targets and generate the report. Reports are created in HTML format and can be easily viewed in any modern web browser. Answer 'Yes' when asked if you want to spider (crawl) the target. Confirm the depth limit setting in the dialog that appears. It defaults to -1 for no depth limit. Finally, change any validation and link checking options that you want to change and then run the Batch Wizard job to start crawling the target and generating the HTML report. See also the Validating an Entire Website (new window) documentation topic. The validation is also very configurable. For example, you can generate your own custom validation messages to find specific issues unique to your website or you can generate a custom CSV (comma separated value) file with the validation results (or almost anything else about the validated documents). For more information about the possibilities, see the TNPL Scripting language documentation (new window). If you have any questions then just ask us. NOTE: The Batch Wizard is available only in the professional and enterprise editions of CSS HTML Validator. Validate an entire site, or part of a site, given one URL. Check the links of an entire site, or part of a site, given one URL. Sites can be checked with various "tools", like the "validator" tool, the "link check" tool for only link checking, or the "spell check" tool. When choosing to use the "validator" tool, you can also choose from "full" validation, "errors only", "errors and warnings only", "accessibility messages only", "search engine messages only", or other available validation type. If desired, you can supply your own customized report footer and CSS file to customize the report to your liking. Use the command line processor to launch Batch Wizard jobs automatically or from automated scripts. The Windows Task Scheduler can also be used to launch jobs and create reports. XML output is available in the enterprise edition. The enterprise edition also supports advanced customization capability and posting to URLs. Many other options and customizations are not listed here. The Batch Wizard shown running on Windows 10.